IBDs can now help find the cure for breast cancer without even stepping into a laboratory. All they have to do is stock and sell the limited edition "Pink Road Trainer" from Kurt Kinetic which Lexco will have available beginning in mid-August. Kurt Kinetic will donate a portion of every sale of the Pink Road Trainer to the Susan G Komen for the Cure, which for more than 25 years has played a critical role in every major advance in the fight against breast cancer. Kinetic will unveil the trainer to IBDs at this year's Interbike trade show. However, LEXCO will have stock of the product even sooner, by mid-August. "The Kurt Kinetic Pink Road Trainer is a great way for IBDs to help in the fight against breast cancer," says Karen Peterson of Lexco. "The pink trainer will definitely catch customers' eyes while on the store floor and has a unique selling point built in. We believe the Kurt Kinetic Pink Road Trainer will be a real plus for our IBDs. Plus, IBDs will be encouraged to host an indoor 'Train for the Cure' promotion which will drive even more traffic into their stores." Says Pam Sayler, National Sales Manager for Kinetic: "As a cyclist and breast cancer survivor I am thrilled to be part of this program. Within the cycling industry our customer base is nearly 50% women - and with an estimated 182,460 new cases of breast cancer expected to be diagnosed in 2008 merging cycling with this cause is a natural, organic partnership." 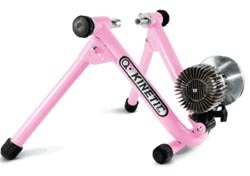 For more details on the Kurt Kinetic Pink Road Trainer program, call Lexco toll-free at (800) 626-6556.